© PA Protesters at the Trump Turnberry resort in South Ayrshire. The protests have already begun, police leave has been cancelled, while the prime minister and her foreign secretary are nervously preparing for any potential mishaps, gaffes or insults: Donald Trump is finally arriving in the UK. [post_ads]The US president’s plane touches down on Thursday lunchtime for a four-day visit sandwiched between the Nato summit and his trip to Helsinki to meet Vladimir Putin. Theresa May is fervently hoping her welcome will keep Trump’s loyalties focused on the former. May has staked considerable political capital on maintaining close ties to the often capricious US president, meaning she and Jeremy Hunt, three days into his job as foreign secretary, will be praying he can remain on message. Before the visit, May lavished praise on the transatlantic relationship, while notably avoiding any direct mention of Trump himself. “There is no stronger alliance than that of our special relationship with the US and there will be no alliance more important in the years ahead,” May said, adding that she was “looking forward to this week’s important discussions”. It is officially a working trip, announced in April after plans for a full state visit were indefinitely shelved amid concerns about protests. But May and her ministers still hope to flatter Trump with pomp and royalty. On Thursday evening at a black-tie business leaders’ dinner at Blenheim Palace, the birthplace of Winston Churchill, Trump will be greeted by military bands and piped out at the end by the Royal Regiment of Scotland. The next day, following a joint counter-terrorism demonstration by UK and US special forces and talks with May at Chequers, Trump and his wife, Melania, will have tea with the Queen at Windsor Castle, this time serenaded by the band of the Coldstream Guards. Even the various menus announced in advance are heavily tailored to Trump’s nursery-food tastes, featuring unthreatening dishes such as beef, and hearty puddings of ice cream or lemon meringue pie. The visit – which will see Trump depart for Scotland on Friday evening for a weekend expected to be largely taken up with playing golf at one of his own courses – has also been shaped to keep him away from expected mass protests. 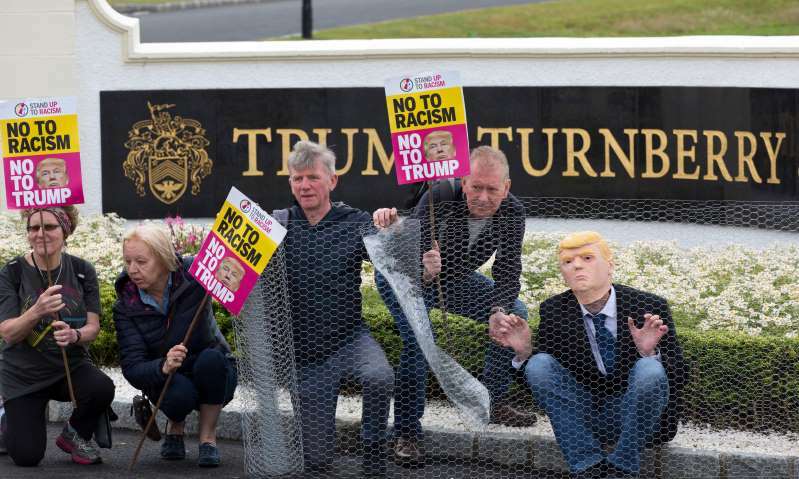 These had already begun in Scotland on Wednesday, with activists from an anti-racism group staging a brief demonstration at Trump’s Turnberry course in South Ayrshire. Big crowds are expected in London on Friday, when the giant “Trump baby” balloon caricaturing the president as a nappy-wearing, phone-clutching infant, will be hoisted above Westminster. Policing the visit will cost a minimum of £12m, with leave for thousands of officers cancelled, a particular strain for forces on alert for possible disorder amid England’s World Cup campaign. Around 4,000 officers will be drafted into areas Trump is visiting, the biggest mobilisation since the 2011 riots across England. The National Police Chiefs’ Council has urged the public to avoid putting any extra strain on officers, many of whom will work 12-hour shifts. Police have also secured a temporary ban on low-flying aircraft from parts of the UK being visited by Trump, for security reasons. One of the obstacles to a state visit had been objections to Trump addressing parliament, a traditional element of such trips, including a controversial ban by the Commons Speaker, John Bercow. However, some MPs will be presenting another view. Rightwing thinktank the Bow Group has organised a welcome event for Trump on Thursday in parliament, even though the president will get no nearer than the US ambassador’s residence, four miles to the north in Regent’s Park. Conservative MP Daniel Kawczynski, who will join Nigel Farage and others at the event, said he hoped it would be a counter to the “very easy and very populist” denigration of Trump by Labour and others. “I don’t know the man, I’m not commenting on his personality or him as an individual,” he said. “I’m interested in his position representing our closest ally.